If Star Wars has taught us anything, besides the fact that Boba Fett is hella cool, it’s that the story doesn’t have to end when the movie series does. Over a period of a decade, author J.K. Rowling brought us the very elaborate tales of Harry Potter and his friends and enemies. Of course, the best-selling novels were made into a collection of hit movies. When the books and movies ended, some fans probably assumed that they wouldn’t get to experience the “Wizarding World” again. However, several books and a play have kept the franchise alive. In 2016, the wizards returned to the screen with Fantastic Beasts and Where to Find Them. That movie felt like a misfire, but it was a hit, so now we have Fantastic Beasts: The Crimes of Grindelwald. Can it re-capture the Potter magic. Fantastic Beasts: The Crimes of Grindelwald opens not long after the finale of the last film. The villainous Grindelwald (Johnny Depp) is being held at The Ministry of Magic in New York City. While being transferred to London, he mounts a daring escape. Speaking of London, Newt Scamander (Eddie Redmayne) is having his own meeting at The Ministry of Magic, accompanied by his brother, Theseus (Callum Turner), and his old schoolmate, Leta Lestrange (Zoe Kravitz), to discuss the fact that he’s not allowed to travel abroad. Following this, Newt is approached by Albus Dumbledore (Jude Law), his old teacher from Hogwarts, who asks Newt to travel to Paris in order to find Credence Barebone (Ezra Miller), a strange young man who Newt encountered in New York. Accompanied by muggle Jacob Kowalski (Dan Fogler), Newt goes to Paris, where he discovers that Grindelwald is attempting to start a war. Here's something else that J.K. Rowling and George Lucas have in common – they don’t know when to stop. Both are filthy rich and yet, they clearly can’t turn off the creative juices. The problem is that their creativity comes off as more-and-more misguided as time goes on. Rowling created the original Fantastic Beasts and Where to Find Them as a faux textbook from Harry Potter’s world. It was merely a field guide to monsters and had no narrative. So, when it was decided that something should be done to carry on the “Potterverse” movies, she wrote a completely new wizarding story and they slapped that familiar title on it. The link to the book was to be the fact that Newt studied strange creatures and had a knack for communicating with them. What we didn’t know at the time was that a new branch of wizard mythology was brewing just beneath the surface of that seemingly simple movie. Rowling once again takes the reins as screenwriter for Fantastic Beasts: The Crimes of Grindelwald and this time she seems determined to make the story as dense as those found in her novels. There are myriad plots going on here – Newt and Tina (Katherine Waterston), Jacob and Queenie (Alison Sudol), Credence and Nagini (Claudia Kim), Theseus and Leta, and finally, Grindelwald and his minions. And, of course, we also have the subplot concerning Dumbledore asking Newt to be his spy. The movie attempts to juggle all of these stories, and never spends enough on any of them for us to get enough information or, worse, care. The movie can’t be bothered with the fact that you may not clearly remember the details of the first film and simply dives into the story. (The deleted scenes included on the Blu-ray Disc show that this wasn’t always the case, as there was meant to be more information in the first act.) I can’t say that I had a favorite part of Fantastic Beasts: The Crimes of Grindelwald, but I was interested in seeing Newt and Tina reunite. Not only does this take too long to occur, once it does, nothing happens. Those hoping for a continuation of Newt’s work with the titular “fantastic beasts” will be disappointed by the film. Yes, there are some creatures here, but they take a backseat to the overwhelming story and multitude of characters. Speaking of Newt, what is up with how Redmayne has chosen to play him? His lack of eye-contact and unusual mannerisms make it look like he’s either blind or on the spectrum. There’s nothing wrong with either of those things, but one would have to assume that the movie would let us know if either was true. As it doesn’t we get a main character who is far too quirky to be asked to carry a film. I would love to say that Fantastic Beasts: The Crimes of Grindelwald is a great return to the world of Harry Potter, but it isn’t. When simply judged as a movie, it doesn’t work as it’s far too scattershot and never finds its voice or purpose. Scenes happen, but they hold no emotion or resonance for the audience. Worst yet, Rowling seems to have forgotten that it was the whimsy of seeing the world through the eyes of Harry and the other young characters which made those stories work. Here, we have a group of adults who are doing their jobs. While they may be fantastical jobs, they have no sense of wonder. The finale of this film solidified the notion that it was the second chapter in what will be a trilogy (or more). The question is, will anyone come back to see what happens next? Fantastic Beasts: The Crimes of Grindelwald made me wonder how many careers there are for wizards on 4K UHD courtesy of Warner Bros. Home Entertainment. The film has been letterboxed at 2.35:1 and the Disc contains an HEVC 2160p transfer which runs at an average of 55 Mbps. The image is sharp and clear, showing no grain and no defects from the source materials. The colors look good, as we get some brighter tones with some of the creatures, and the image is never overly dark or bright. The picture is well-balanced, but it does quite have the crispness that I’ve seen with other 4Ks. The Disc carries a Dolby Atmos audio track which runs at 48 kHz and an average of 4.5 Mbps. The track provides clear dialogue and sound effects. The action sequences feature bold surround and stereo effects, which include some detailed sounds. The subwoofer is also active during these moments. The result is an audio display which envelops the viewer. 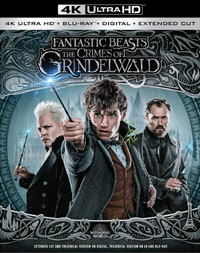 All of the extra features for Fantastic Beasts: The Crimes of Grindelwald are found on the Blu-ray Disc included in this package. “J.K. Rowling: A World Revealed” (10 minutes) offers an interview with the author, where she discusses the challenge of writing a screenplay and her approach to building a new narrative world in the Fantastic Beasts films. “Wizards On Screens: Fans in Real Life” (19 minutes) has Ezra Miller and Evanna Lynch – Luna Lovegood from the original Harry Potter films – watching scenes from the film together. Apparently, they are both “Superfans” of the series and they are thrilled about “geeking out” together. Great. “Distinctly Dumbeldore” (10 minutes) asks the question, “Who can stand face to face with Johnny Depp and with Eddie Redmayne and not be acted off the screen?” Anybody? We get an interview with Jude Law who discusses his take on this iconic character. “Unlocking Scene Secrets” (49 minutes) breaks down six sections of the film to examines the specifics in production design and visual effects. This includes a nice amount of behind-the-scenes footage. Finally, the Disc offers ten DELETED SCENES which run about 14 minutes. This includes an alternate opening which actually tries to tie this film to the first one, followed by a scene which shows how Credence gets to London.